There wasn't much disagreement among the nine high school French students who made their way to Lafayette all the way from Indiana as part of their French class. They all agreed their favorite part of the trip was the music, or the food, or maybe the friendly people. Ok, maybe there was some disagreement. But it was a trip unlike any other, that's for sure. And it was all made possible by one very innovative French teacher who thought learning about Cajun culture and history would make for an excellent learning opportunity. "The idea was that we would spend our first two weeks in the class learning all about Cajun language, culture, history, and folk life," said Shannon Swann, French teacher at University High School of Indiana. "And then, we would come here and see it for ourselves." 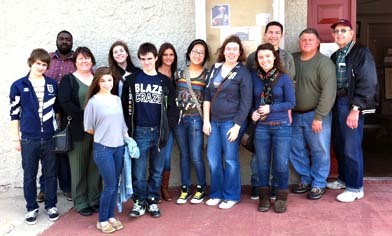 So this week, Swann and her University High School students were in Acadiana to do just that. They arrived in New Orleans on Thursday then visited Breaux Bridge and Lafayette over the weekend. On Monday, they took a trip to Erath to see the Acadian Museum started by local attorney and Cajun historian Warren Perrin. 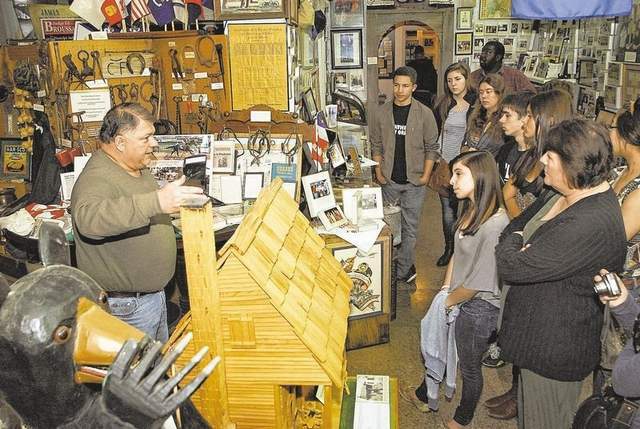 Lafayette Parish School Board member Kermit Bouillion helped guide the students through the vast array of Cajun artifacts, pictures and historical documents. "Isn't that impressive? We really take it for granted, our language, our cuisine," said Bouillion. "We really take it for granted, and it's so impressive that these kids came all the way from Indiana and are so excited to be here. I'm thinking as a school board member, isn't this a great learning experience?" Freshman Dimitri Putney agreed that taking a trip to the very place you learn about in class is a way better way to go. "This enhances the experience so much because it's not just listening to lectures," said Putney. "You actually get to touch and experience what the Cajun culture is all about. When we started learning about the music that was my favorite part." Swann says that her biggest surprise was seeing how much the students got into the Cajun music. "I wasn't expecting a group of teenagers to be that excited about what is kind of old fashioned music but they love it," Swann said. "We started dancing in the classroom before we got here and yesterday they spent three hours in a dance hall learning the steps and dancing with much older partners." Museum owner and former CODOFIL president Warren Perrin has hosted many groups like this one. He says it is wonderful to see students and teachers taking the historical aspect so seriously. "One student asked me what made us begin to try to save the French language in the state," said Perrin. "I explained to them that CODOFIL was a direct and indirect result of the civil rights movement in the mid sixties. It came from people realizing that their basic right to free speech and to speak French was prohibited for 50 plus yeas. CODOFIL changed that and bringing it back led to cultural tourism, now our second largest industry in the state." As a French teacher, Swann says she is especially concerned about how other languages are becoming more popular for students to learn. That's why she and her students are particularly interested in the effort to save the French language in Louisiana. "I think the need to learn French won't ever go away," said Swann. "What people don't realize is how widespread the language is around the world." It was wonderful! One of the local hosts at the museum in Erath spoke to the kids in French and the other told them about his experiences growing up in a family of trappers. We also got to meet your son, of course, and see the Royal Proclamation for ourselves. David Bertrand was an amazing host at Shucks! He talked with us quite a bit about the various dishes on the menu; served alligator bites for all of them to try; and took the kids on a short tour of the kitchen while explaining the background to the oyster business. They loved it. I had mentioned to him that we were planning to buy a King Cake while we were there, and he offered us one from his bakery -- a big hit with the kids! From there, we went to the Depot and the kids bought some souvenirs, then to Avery Island for a tour and finally to St. Martinville to see the Evangeline Oak, the St. Martin de Tours church, and the Acadian memorial. It was closed by the time we reached it, but we were able to see the memorial garden in the back with the mosaics representing the various Acadian families who settled in Louisiana, and it was an important moment for the students (and me). We walked around town and to the bridge over the Bayou Teche -- again an exciting moment after seeing the name in their readings and knowing its central place in Acadian settlement in Louisiana. We were all sad to leave "Cajun country" (although they have had a nice time in New Orleans today), but they have some wonderful memories to take back with them. Many of them have commented that they were very excited to meet you, and I cannot thank you enough for taking the time to meet with them and speak with them about your experiences. It is one thing for them to learn in books about people who stand up and make a difference, but having the opportunity to meet someone like you who has accomplished so much on behalf of a group of people who deserved a champion is an experience they will never forget. As for me, a couple of months ago, I was just beginning to learn about Acadian history and culture, and now I feel a connection to this place and to the culture that is hard to explain. Thank you so much for helping make this such a special visit -- both for my students and for me.